The International Maritime Organization (IMO) adopted a mandatory Fuel Oil Data Collection System (DCS) for international shipping as part of its ongoing efforts to reduce greenhouse gases (GHGs) and carbon dioxide emissions in shipping. The new mandatory DCS will provide a basis for an objective, transparent and inclusive policy debate in the IMO’s Marine Environment Protection Committee, part of a roadmap to develop a comprehensive IMO strategy on reduction of GHGs emissions from ships. A description of the methodology used to collect and report fuel consumption data required by Regulation 22A of MARPOL Annex VI must be included within the SEEMP Part II. The SEEMP must be verified by a Luxembourg authorized Recognised Organisation which will subsequently issue a Confirmation of Compliance on behalf of the Luxembourg flag. Owners shall report aggregated Luxembourg ship fuel consumption data, collected in accordance with the SEEMP procedures, to a Recognised Organisation authorized by the Luxembourg Maritime Administration to carry out the verification process on its behalf. The data must be provided to the RO within three months of the end of each calendar year. Upon satisfactory verification that the data has been collected per Regulation 22A of MARPOL Annex VI, the authorized RO will issue a Luxembourg Statement of Compliance to the ship. The Statement of Compliance is valid for one year and the first five months of the following calendar year and shall be kept on board. Verification of the reporting data and issuance of a Statement of Compliance must be completed no later than five months following the end of each calendar year. The collected information is subsequently transferred to an IMO Ship Fuel Oil Consumption Database. The IMO produces an annual report to MEPC summarizing the data collected. MEPC.1/Circ. 871 Sample format for the confirmation of compliance pursuant to regulation 5.4.5 of MARPOL Annex VI. EU Regulation 2015/757 (as amended by Delegated Regulation 2016/2071) on the monitoring, reporting and verification of emissions of CO2 from maritime transport (“MRV Regulation”) establishes rules for the accurate monitoring, reporting and verification of CO2 emissions. The MRV Regulation, which entered into force 1 July 2015, is the first step of the European Commission’s strategy to progressively integrate maritime emissions into the EU’s domestic greenhouse gas emission reduction policy. The MRV Regulation applies to ships above 5000 GT, in respect of their CO2 emissions released during voyages from/to EEA ports carried out after 1 January 2018. Warships, naval auxiliaries, fish-catching or fish-processing ships, ships not propelled by mechanical means, and government ships used for non-commercial purposes are excluded. Ship activities originating or terminating in a port of call and serving the purpose of transporting passengers and cargo for commercial purposes are defined as voyages. This includes ballast voyages, from the last port of call where the ship discharges cargo or disembarks passengers to the next port of call where cargo is loaded or passengers embarked. support to offshore installations, such as drilling rigs‎, natural gas and oil platforms, offshore wind farms. “Ship to ship” transfers performed at sea are also covered by the MRV Regulation as part of a voyage calculated from the last port of call to the next port of call. For a voyage to be covered by the MRV Regulation, at least one of the ports of call must be located in an EU territory. The MRV Regulation also applies to Norway and Iceland. Responsibility for MRV compliance rests with the “MRV company”. This can be the Shipowner or any other organisation/person assuming responsibility for the operation of the ship. MRV Verifiers must be accredited by a National Accreditation Body (NAB) to perform MRV Regulation verification activities. All Luxembourg authorised Recognised Organisations are accredited MRV verifiers. MRV companies can contract any duly accredited verifier, regardless of where the MRV company or the accredited verifier are based. Flag changes have no effect on the EU MRV reporting. The International Convention for the Control and Management of Ships’ Ballast Water and Sediments (BWM Convention) establishes standards and procedures for the management and control of ships’ ballast water to prevent the spread of harmful aquatic organisms from one region to another. The BWM Convention entered into force on 8 September 2017. The BWM Convention applies to ships registered under contracting Parties to the BWM Convention, which take up and use ballast water during international voyages. Ships above 400 GT are subject to the approval of the BWM Plan, a survey and the provision of a BWM Certificate. Ships below 400 GT must have an approved BWM Plan on board. Surveys and certification will be subject to the requirements set by the Administration. Ships registered under a flag which has not ratified the BWM Convention may not be issued with the relevant Certificates. However, port States which are Parties to the BWM Convention will expect ships calling their ports to comply with the BWM Convention’s requirements to ensure no more favourable treatment. Ships are required to implement and keep on-board a Ballast Water Management Plan approved by the Administration (Regulation B-1). The Ballast Water Management Plan is specific to each ship and includes a detailed description of the actions to be taken to implement the Ballast Water Management requirements and supplemental Ballast Water Management practices. The BMW Plan shall include safety procedures for the ships and crew associated with the BWM Plan and procedures for the disposal of sediments. The approval and certification of BWM plans for ships flying the Luxembourg flag is delegated to authorized Recognised Organisations. A Ballast Water Record Book entries shall be signed by the officer in charge of the operation concerned as well as the Master. Ships of 400GT and above must have an International Ballast Water Management Certificate issued by or on behalf of the Flag State Administration which certifies that the ship carries out ballast water management in accordance with the BWM Convention and specifies which standard the ship is complying with, as well as the date of expiry of the Certificate. 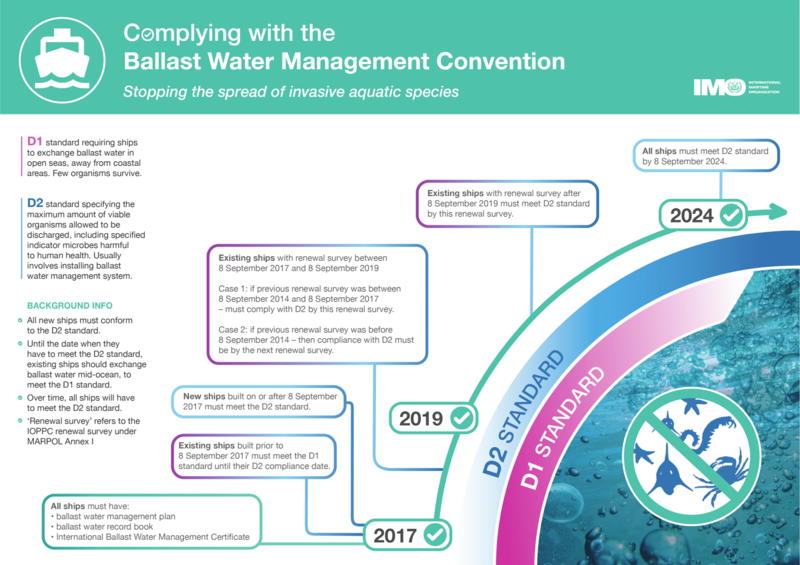 The BWM Convention provides two ballast water management standards to prevent harm to the marine ecosystem. All Ships covered by the BWM Convention must currently comply with the D-1 standard under which ships shall exchange their ballast water in open seas, away from coast areas. Ships performing Ballast Water exchange shall do so with an efficiency of 95 per cent volumetric exchange of Ballast Water. For ships exchanging ballast water by the pumping-through method, pumping through three times the volume of each ballast water tank shall be considered to meet the standard described. Pumping through less than three times the volume may be accepted provided the ship can demonstrate that at least 95 percent volume metric exchange is met. An approved Ballast Water Management Plan and Ballast Water Management Certificate or Statement of Compliance must be on board. When these requirements cannot be met areas may be designated where ships can conduct ballast water exchange. All ships shall remove and dispose of sediments from spaces designated to carry ballast water in accordance with the provisions of the ships’ ballast water management plan (Regulation B-4). The requirement to meet the D2 ballast water performance standard may be achieved through the installation of an appropriately approved ballast water management system. The deadline for installation of ballast water treatment system is the first International Oil Pollution Prevention (IOPP) renewal survey following 8 September 2017. Ships conducting ballast water management shall discharge less than 10 viable organisms per cubic metre greater than or equal to 50 micrometers in minimum dimension and less than 10 viable organisms per milliliter less than 50 micrometers in minimum dimension and greater than or equal to 10 micrometers in minimum dimension; and discharge of the indicator microbes shall not exceed the specified concentrations. Type approval for Ballast water treatment systems are determined according to IMO guidelines. The IMO maintains a list of Type Approved BWM Systems. The United States is not a party to the BMW Convention. Ships calling US ports should therefore also comply with United States Coast Guard (USCG) type-approval procedures and BWM requirements. Those which intend to discharge ballast water must carry out exchange or treatment as well as fouling and sediment management. Ballast water exchange in US waters will only be permitted prior to treatment system implementation deadlines for treatment systems enter into force. It is worth noting that the USCG has introduced different BWTS implementation deadlines than the BWM Convention. Luxembourg vessels are required to comply with the standards that at least meet the requirements of regulation D1 (Ballast Water Exchange Standards) until such time as Regulation D-2 (Ballast Water Performance Standards) becomes applicable to the ship. The Luxembourg Maritime Administration has delegated BWM approval and certification to Recognised Organisations. Given the challenges posed by the BWM Convention compliance date for ships to meet the D-2 Standard, the Luxembourg Maritime Administration has considered requests on a case-by-case basis for the early renewal and de-harmonization of the IOPP certificate from other statutory certificates covered by the Harmonized System of Survey and Certification (HSSC). a renewal IOPP survey is completed on or after 8 September 2014 but prior to 8 September 2017. The ship should be D-2 compliant on the second IOPP renewal survey following entry into force, if the first renewal survey following the date of entry into force of the convention is completed prior to 8 September 2019 and if conditions 1 or 2 above are not met. The IOPP Certificate should be harmonized with the other class and statutory HSSC certificates through an additional renewal survey.